Attention, Seattle! NCR on Tap is coming to your city April 5. Join editor Dennis Coday and others for an evening of food, drinks and good conversation about the church. Learn more. There is no evidence to suggest that the Obama administration was behind the coup. However, a number of U.S. officials — most notably then-Secretary of State Hillary Clinton — played an important role in preventing Zelaya’s return to office and the junta consolidating its power in the face of massive nonviolent protests. Clinton insisted the day after the coup that “all parties have a responsibility to address the underlying problems that led to yesterday’s events.” When asked if her call for “restoring the constitutional order” in Honduras meant returning Zelaya himself, she didn’t say it necessarily would. State Department spokesperson Ian Kelly evaded reporters’ questions as to whether the United States supported Zelaya’s return, placing the United States at odds with the Organization of American States, the Rio Group, and the U.N. General Assembly, all of which called for the “immediate and unconditional return” of Zelaya. U.S. Ambassador to Honduras Hugo Llorens, reflecting the broad consensus of international observers, sent a cable to Clinton entitled “Open and Shut: The Case of the Honduran Coup,” thoroughly documenting that “there is no doubt” that Zelaya’s ouster “constituted an illegal and unconstitutional coup.” Similarly, Ann-Marie Slaughter, then serving as director of Policy Planning at the State Department, sent an email to Clinton strongly encouraging her to “take bold action” and to “find that [the] coup was a ‘military coup’ under U.S. law.” However, Clinton’s State Department refused to suspend U.S. aid to Honduras — as required when a democratically-elected government is ousted in such a manner – on the grounds that it wasn’t clear that the forcible military-led overthrow actually constituted a coup d’état. Emails released last year by the State Department also show how Clinton rejected calls by the international community to condemn the coup and used her lobbyist friend Lanny Davis — who was working for the Honduran chapter of the Business Council of Latin America, which supported the coup — to open communications with Micheletti, the illegitimate interim ruler installed by the military. In the subsequent six years, the horrific repression and skyrocketing murder rate — now the highest in the world — has resulted in tens of thousands of refugees fleeing for safety in the United States. Ironically, as Secretary of State, Clinton rejected granting political asylum and supported their deportation. “Between the time of the (Honduran) coup (June 2009) and February 2012, there were at least 59 politically motivated assassinations of civilians associated with the resistance movement. This is a low estimate, as intimidation and fear of reprisal prevents communities and family members from reporting many such deaths. There were at least 250 violations of human rights in the military junta’s first three months alone.” – Committee of Family Members of the Disappeared of Honduras (COFADEH), respected human rights organization. “This is nothing more than a plan to get rid of the national debt by auctioning off the country,” ex-president Manuel Zelaya, overthrown in a US-backed 2009 coup. “I can hire one half of the working class to kill the other half.” – Jay Gould, railroad robber baron, as he hired armed Pinkerton detectives (and other goon squad thugs) to brutally break a labor union strike. Last Sunday I attended a vigil at Peace Church here in Duluth, MN that commemorated the life and death of assassinated Honduran environmental activist Berta Caceres, a 44 year-old mother of 4. Caceres has been devoting her life organizing her fellow aboriginal tribal members (the Lenca Indians), fellow Hondurans and other justice-loving citizens of the world in resisting the privatization of their ancestral lands, resources and rivers by foreign investor groups and the traitorous collaborating politicians and businessmen that rule Honduras. Those “traitors” to her homeland’s indigenous rights are being militarily backed-up by the Honduran military, the private corporation’s armed guards, and shadowy “death squads” who have been harassing Berta and other resistors with death threats, intimidation and killings over the years. The vigil was somber and meditative and a call to some sort of action to those in attendance. To me it was also a call to do something to resist other tyrannical corporations that are forging ahead with their nefarious plans to exploit and extract our precious, irreplaceable resources by any means necessary. I have long believed that, in order to be effective, it is necessary to name out loud, not just the evil that is being done to the land and it creatures, but also the suspected or proven evil-doers That exercise was effective in my practice of holistic health care, where victims of neglect or psychological, sexual, physical, emotional, spiritual trauma needed to not only identify the signs and symptoms of their mental ill health, but also to name the perpetrators of the violence, which were individuals, groups or cultures. Doing so was very therapeutic and often curative. So, in addition to commemorating the life and death of another martyr to the cause of peace and environmental justice, I feel that it is important to understand the history of the power-hungry perpetrators of violence to the land, its creatures, whether it be greedy individuals, greedy corporate entities, blinded or co-opted bureaucracies or military or police organizations that solve their problems by inflicting violence on others. Therefore I offer below the following timeline of historical events in Honduras that led up to Berta’s execution, starting with the gold-obsessed Christopher Columbus and the evil conquistadors that followed him to a new world that was already occupied by First Nations’ peoples who were massacred or otherwise cheated out of their sovereign right to make use of their own land, mineral and water resources as they saw fit. I have obtained the information from a multitude of historically accurate sources. Of course this pattern of exploitation should familiar to anybody who is awake. It happened (and is still happening) to aboriginal peoples in our own backyard, whether it is in the United States, Canada or in the South Pacific, Southeast Asia, Africa, South America, Australia, New Zealand or most everywhere else around the world. Powerful entities like extractive, polluting and otherwise exploitive multinational corporations like PolyMet, Twin Metals, Glencore and Enbridge (just to mention the few companies that are threatening the environmental health of northern Minnesota) need to be resisted. Please offer any help you can give to the Duluth 7 activist group, which is facing criminal trespass charges when they tried to deliver a protest letter to the corporate Duluth offices of Enbridge Energy, a Canadian oil pipeline company on November 2, 2015. Their arraignment is scheduled for April 1. 1502 During 4th voyage Christopher Columbus reaches the coast of Honduras, then travels south to Panama. 1525 Spain conquistadors begin the brutal military assault on Honduras and all of Central and South America, with millions of innocents displaced and executed. 17th century The northern coast of Honduras falls to British buccaneers. British Honduras (now Belize) is established as a British colony, along with many Caribbean island nations. 1860 William Walker, US physician and pro-slavery soldier of fortune from Nashville, TN, leads mercenary soldiers in temporarily “conquering” Nicaragua. He is executed by firing squad by the Honduras government. 1898 April-December: Spanish-American war. Following the war, the US militarily occupies Cuba and Puerto Rico. 1899, March 30 The Boston Fruit Company merges with the Snyder Banana Company, and renames itself the United Fruit Company. The company at one time controlled 75% of the banana market in the US. 1903 November: The United States, with an eye on digging an interoceanic canal, conspires with separatist groups in the Colombian state of Panama to declare independence from Colombia. The US government sends the US Navy to prevent Colombia from recovering its territory. As soon as Panama’s independence is assured, the US obtains control over a strip of land (ultimately called the Canal Zone) through which it plans on building the canal. 1903 The United States invades Honduras. 1903 US invades the Dominican Republic. 1906 The US Army re-invades Cuba. The American occupation remains until 1909. 1907 US troops invade Nicaragua and establish a protectorate in the country. 1907 Due to political violence, US re-invades Honduras during the war with Nicaragua to “protect American lives”. 1909 US Army re-invades Nicaragua. 1912 The US Army sends troops to Cuba. 1912 US marines land in Panama during the contested presidential elections. 1912 The US Army intervenes again in Honduras. 1914 The US Navy fights against rebels in Santo Domingo, Dominican Republic. 1915 The US Army invades Haiti. 1916 The US Army invades the Dominican Republic. 1917 The US Army invades Cuba. The American occupation lasts until 1933. 1918 The US Army intervenes in Panama and keeps a police force in the country. 1919 The US marines land in Honduras during the presidential campaign. 1920 The US Army lands in Guatemala and fights for two weeks and puts down a peasant union movement against the United Fruit Company. 1924 US military “intervenes” in Honduras to “protect American interests” (ie, the profitability of the United Fruit Company) during a presidential election. 1925 US Army lands in Panama during a general strike against the banana plantation owners. 1932 US Navy intervenes in the Marti Revolt in El Salvador. 1932-49 Honduras suffers under the military dictatorship of General Tiburcio Carias Andino and his right-wing National Party of Honduras (NPH). 1933 First election to the presidency of Honduras of General Carias, who developed close ties with his fellow right-wing, neofascist , military dictators in Guatemala, El Salvador and Nicaragua, all supported by the US. He remained in office until 1949. 1934 In a military coup, US-backed military dictator Anastasio Somoza takes power in Nicaragua and outlaws political parties that favor the poor and working class. He was assassinated on September 17, 1980. 1945 The United Fruit Company introduces Miss Chiquita Banana as the company’s official symbol. 1953 President Dwight D. Eisenhower authorizes Operation PBSUCCESS, a covert operation in which the CIA funds, arms, and trains 480 men led by Carlos Castillo Armas, the first of many of Guatamala’s (and other Central and South American) military dictators vigorously supported by the US. 1954 After escaping from prison following an abortive military coup attempt (1950) against the Guatemalan government, strongman and dictator-to-be Carlos Castillo established an army in neighboring Honduras. Castillo received financial and military support from the CIA and political support from Republican US Secretary of State John Foster Dulles and CIA Director Allen Dulles. The Dulles brothers were once lawyers for the United Fruit Company. 1954 Castillo’s army invades Guatemala in June, 1954, successfully overthrowing the democratically-elected Jacobo Arbenz, who had instituted land reform benefitting the landless peasants (the 99%) – opposed vigorously by the United Fruit Company, its bought-and-paid-for politicians and wealthy landowners (the 1%). 1954 Che Guevara witnesses the CIA-backed coup in Guatemala against Arbenz and is convinced that only armed revolutions can overthrow fascists and wealthy land-owning tyrants. 1956 The Honduras military ousts civilian president Lozano Diaz in a bloodless coup. Honduras was subsequently ruled by a military junta for the next two years. 1957 José Ramón Adolfo Villeda Morales is elected Honduran president. He serves for 6 years. 1963 October 13 The presidential candidate of the Liberal Party of Honduras, campaigning on the platform to abolish the military, is expected to win the election. But Honduran democracy is again thwarted by a military coup d’etat shortly before election day. 1963 General Osvaldo Lopez took power after the coup and served as president until 1971. 1972 General Lopez again takes power in another coup d’etat and serves until 1974. 1974 General Lopez resigns after he was exposed for accepting a bribe of over a million dollars from United Fruit. 1974 Hurricane Fifi devastates Honduras, killing 5,000. 1975 Colonel Juan Alberto Melgar Castro takes power. 1978 General Policarpo Paz Garcia ousts Melgar in a coup. 1981 Roberto Suazo Cordova, of the Centrist Liberal Party of Honduras, is elected president. He leads the first civilian government in more than a century. 1982 Brutal Guatemalan dictator (and fundamentalist Christian) Rios Montt meets with US President Ronald Reagan in Honduras. Reagan dismisses reports of egregious human rights abuses in the region and resumes weapons sales to military rulers. 1986 President Reagan issues an executive order granting emergency aid for Honduran army. 1988 Amnesty International reports increases in human rights violations by Honduran armed forces, and right-wing death squads. 1989 General Alvarez is assassinated. 1990 Rafael Callejas is sworn in as president; last Nicaraguan Contras leave Honduras. 1990-1998 Honduran military death squads kill hundreds. 1995 Compulsory military service is abolished. First military officers charged with human rights abuses. 1997 Carlos Flores, Liberal Party,is elected president, pledging to restructure armed forces. 1998 Hurricane Mitch devastates Honduras. Cholera and malaria epidemics ensues. 1999 Honduran armed forces is placed under civilian control. 2001 Honduran Committee for Defense of Human Rights states that more than 1,000 street children were murdered in 2000 by death squads backed by the Honduran police. A drought ravages Central America, and Honduras loses 80% of its grain crops. 2002 Honduras restores diplomatic ties with Cuba. 2003 Thousands of protestors across Honduras unite to demand that the government revoke debt payment agreements with the IMF. Sadly, Honduras, Guatemala, El Salvador and Nicaragua agree to the terms of NAFTA (North American Free Trade Agreement). 2005 Liberal Party’s Manuel Zelaya, a social democrat, wins presidential election. Honduran Congress approves Central American Free Trade Agreement. 2006 Zelaya inaugurated as new president, promises to fight corruption. 2008 Honduras joins Bolivarian Alternative for Americas, headed by Venezuelan President Hugo Chavez. 2008 Zelaya administration blocks many hydroelectric dam projects, siding with the aboriginal people who would be most affected. 2009 June President Zelaya forced into exile following a US-supported military coup d’etat. Porfirio Lobo of the conservative National Party of Honduras installed as president in a fraudulent election November 2009. 2010 President Juan Orlando Hernandez becomes the country’s president in an election marred by allegations of fraud and intimidation. Orlando, a businessman, is a staunch supporter of foreign investments in dams, mining, tourism and oil. Since the 2009 coup, the US builds up its air base presence in Honduras through the establishment of three forward operating bases, ostensibly for “drug interdiction”. 2011 Honduras receives more than $50 million in Pentagon contracts. 62 percent of all Defense Department funds intended for Central America that year go to Honduras. 2012 January President Orlando is invited to visit the US Military’s Southern Command headquarters in Miami to meet with high-ranking officials. 2012 May At least 4 people are gunned down by Honduran forces firing from a US State Department helicopter, under the supervision of uniformed DEA and US Navy agents. March 3, 2016 The courageous anti-tyranny activist Berta Cáceres is executed in her sleep by a right-wing death squad connected to those who were issuing the constant death threats. Cáceres was the cofounder of the Civic Council of Popular and Indigenous Movements of Honduras (COPINH). She was an unrelenting activist protecting her Lenca Tribe’s First Nation’s natural resources, lands and rivers against powerful, military-backed, consortiums of US banks, IMF and World Bank predatory lenders, dam construction companies and mining companies that are intent on unethically – and illegally (in violation of international law) – exploiting the indigenous people’s natural resources. Honduras is reeling from the assassination of prominent indigenous rights activist and environmental leader Berta Cáceres, who was gunned down in her home in La Esperanza on March 2. For years, she had faced death threats from industrialists who laid claim to the land of her people, the Lenca. Her hallmark fight pitted her against powerful figures who sought to dam the Gualcarque River—a sacred site for the Lenca. The construction would have threatened the indigenous group’s livelihood and spiritual connection to the river. Cáceres’ most public battle may have focused on the small indigenous communities of Rio Blanco that live adjacent to the river, but her struggle was far from local—indeed, her efforts to protect indigenous land rights made her a national and global symbol, standing against transnational capitalism and the threat it poses not only to indigenous people throughout the developing world, but to global ecology as well. In the wake of Cáceres’ death, thousands mobilized to march in Tegucigalpa on March 17 and 18. Outside of Honduras, the killing has galvanized a groundswell of outrage as well. Hundreds of international organizations and academics have signed letters condemning the killing and demanding justice, and activists unfurled a protest banner in front of the headquarters of the U.S. Agency for International Development (USAID) in Washington and disrupted a meeting of the Council of the Americas attended by U.S. ambassadors to Central America. Inside the beltway, U.S. Senator Patrick Leahydenounced the United States’ role in “supporting and profiting” from the “corruption and injustice” in Honduras, and 62 members of the House of Representatives have sent a letter to U.S. Secretary of State John Kerry and Secretary of the Treasury Jacob Lew to demand an independent investigation into Cáceres’ death and the suspension of U.S. military aid to Honduras. Washington is the Honduran government’s biggest patron, and it must now decide which side of the nation’s history it wishes to be on. Cáceres came of age during the 1980s, a decade marked by brutality across Central America. She was raised in a household that was steeped in the ideas and actions of resistance. The Cáceres family spent nights huddled around a radio listening to revolutionary dispatches from Nicaragua. Her mother, also named Berta, frequently took in refugees fleeing the civil war in El Salvador. Cáceres first entered politics in 1993 when she co-founded the Civic Council of Popular and Indigenous Organizations of Honduras(COPINH). COPINH sought to resist illegal logging and protect therights of indigenous people, a group historically excluded from Honduras’ political system. Cáceres soon emerged as a leader in a broader social movement that united a coalition of marginalized groups seeking greater political and economic inclusion. Cáceres spent the next 16 years advocating for the rights of indigenous peoples, women, and other marginalized groups. To advance those goals, she helped build a social movement in Honduras and established strong connections to groups across the region and around the world. Her work became particularly urgent after the coup in Honduras in 2009 that ousted democratically elected president, Manuel Zelaya. The president had laid the groundwork for populist changes which included land reform, efforts that were scrapped once Zelaya was out of office. Since then, life has become harder for activists of all stripes. Indeed, any groups who opposed the new regime’s neoliberal agenda became an official target for retribution. Since the coup, successive administrations have courted foreign capital, engaged in privatization efforts, granted hundreds of hydroelectric and mining concessions to international corporations, and built infrastructure to support the accelerated exploitation of natural resources in Honduras. Among the projects was the Agua Zarca dam over the Gualcarque River—the issue the defined Cáceres efforts. The dam is being built by Desarrollos Energéticos, SA(DESA). Among the company’s owners is the powerful Atala family, suspected of ties to the coup, including Camilo Atala, president of theFicohsa Bank, the largest in the country. The Chinese hydroelectric engineering firm Sinohydro was initially overseeing the work with financing from the World Bank. But the protests over the construction compelled both to withdraw in 2013. Cáceres had also implored other foreign financiers, including the Dutch Development Bank FMO, the Finnish Fund for Industrial Cooperation and German firms Siemens and Voith, to pull their funding. Mounting public pressure after the murder of Cáceres’ and COPINH activist Nelson Garcia two weeks later finally prompted the Dutch and Finnish banks to suspend disbursements on March 16, although they have not permanently withdrawn from the project. The words “Berta Lives” are seen written in chalk to honour the slain environmental rights activist, Berta Caceres during a vigil to mark International Women’s Day in Tegucigalpa, Honduras March 8, 2016. The heart of Cáceres’ strategy was to push the government to recognize that the COPINH’s demands were grounded in internationally recognized rights, including the right to prior and informed consent for projects that affect indigenous communities, and to target the project’s international financiers. At first, Cáceres and COPINH tried to block the Agua Zarca dam’s construction through political channels, including indigenous assemblies, public declarations opposing the dam, and legal challenges. When these failed and construction was set to begin in 2013, it seemed like the community was out of options. The next salvo was peaceful protests. COPINH set up a roadblock that prevented DESA from accessing the river. DESA responded with a concerted campaign of harassment and intimidation that, at times, turned violent. Tomás Garciá, a COPINH protestor who was unarmed, was shot at close range and killed by a Honduran soldier in 2013. Two other members of COPINH have also been killed since then, and others have been attacked with machetes. Cáceres herself had been arrested on charges of illegal possession of a firearm (which she claimed was planted), as well on charges of usurpation, coercion, and damages as a result of the blockade. These charges were ultimately dismissed. In the IACHR’s December 2015 Situation of Human Rights in Honduras report, the group specifically decried the criminalization of Cáceres’ protest movement. According to Global Witness, Honduras was the most deadly country in the world for environmental and land rights defenders in 2014. In the end, COPINH’s orchestrated resistance to the Agua Zarca dam halted its construction in Honduras’ Rio Blanco community, but failed to thwart the project altogether. DESA moved the dam project across the river, near the town of San Francisco de Ojuera, where the company boasted of winning support for USAID projects. Construction began in August of 2015. The conflict simmered on, reaching a boiling point again on February 20, as security forces detained 100 protesters, including Cáceres, who had traveled to the new dam site to register their disapproval. Among those seeking to block the path of the protestors were members of the Honduran military. During the altercation, COPINH members reported that a local official told Cáceres that she would never come back to the project’s new site, and that she might be killed. A man puts flowers on the coffin of slain environmental rights activist Berta Caceres at a cemetery in the town of La Esperanza, outside Tegucigalpa, Honduras March 5, 2016. Since Cáceres’ death, the Honduran government has yielded to tremendous public pressure and agreed to launch a prompt investigation into her murder. Initial signals, however, have inspired little confidence. State investigators ignored the Cáceres family’s demand for an independent expert to attend the autopsy. The crime scene was compromised, and authorities were quick to suggest that her murder was either a crime of passion or a random robbery. Gustavo Castro Soto, a prominent Mexican environmental activist who was injured in the attack and is the sole eyewitness, provided testimony over multiple days in harsh conditions, but was prevented from leaving the country for 30 days, though he believes his life is in danger in Honduras. His lawyer’s license was suspended for 15 days after lodging a request that the decision to detain him in Honduras be revised. To this day, Castro remains in the Mexican Embassy compound in Tegucigalpa for his own safety, despite his stated desire to return home to his family. Intense and prolonged questioning of COPINH leaders have fueled concerns that Honduran authorities are more interested in extracting intelligence about Cáceres’ activist group to distract their efforts, rather than finding her murderer. Cáceres’ family has expressed their doubts about the integrity of any investigation conducted by the Honduran government. They have demanded an independent international investigation to be overseen by the IACHR—one that could not only name the material perpetrators of the crime, but its masterminds as well, however high up the chain of command they may be. Honduran authorities have cited an agreement with the UN High Commissioner of Human Rights to accompany the investigation, but there is good reason to doubt that the local office has the capacity, expertise, and investigative authority necessary to ensure an independent inquiry. Cáceres’ family and the international community have also demanded that the Honduran government implement the IACHR’s orders to keep members of COPINH safe. But activists cannot be protected with armed guards and cameras alone. Rather, Tegucigalpa must confront the root of the social conflict that claimed Cáceres’ life, by respecting the rights of indigenous people, and canceling the concession to the Agua Zarca dam and others. 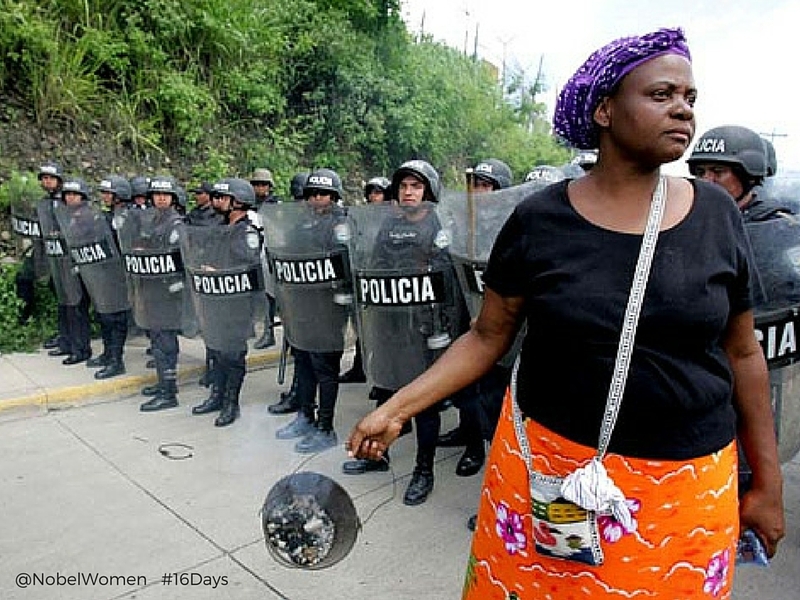 Short of this, the cycle of unrest and repression in Honduras is sure to continue. As U.S. secretary of state, Hillary Clinton provided tacit support for the administration of former Honduran interim President Roberto Micheletti despite near universal condemnation of his tenure. Cáceres herself criticized Clinton for opposing the demand for Zelaya’s reinstatement, which set the stage for a deepening of the human rights crisis inside the country. And despite pervasive and persistent reports of repression—some of which has been directly linked to Honduras’ state security forces—Washington has continued to provide security aid as well as development financing to Honduras. When Cáceres won the prestigious Goldman Environmental Prize in 2015, she dedicated it to “all the rebels out there, to my mother, to the Lenca people, to the Rio Blanco, and to the martyrs who gave their lives in the struggle to defend our natural resources.” She now takes her place on that list, but if her killers thought they could silence her voice and derail her mission, they were mistaken. The extremely high levels of repression and violence in Honduras are not a “Honduran problem” – they are also a U.S. and Canadian problem. Since the June 2009 military coup, that ousted the last democratically elected government, Honduras has become the ‘Murder Capital of the world’, the ‘Repression Capital of the Americas’. Since 2009, the U.S. and Canadian governments have legitimized a succession of illegitimate, repressive regimes. North American companies and investors, and “development” banks (World Bank, Inter-American Development Bank) have increased business activities in African palm production, maquiladora sweatshops, privatized “model cities”, tourism and mining. The Honduran regime remains in power due, in large part, to its political, economic and military relations with the U.S. and Canada and the “development” banks. Across Honduras, community based organizations – struggling for fundamental reform to the Honduran State and society – need considerably more human rights accompaniment, funding, media attention on the harms and violations and education and activism in Canada and the U.S. The news shocked the world, but it wasn‘t entirely unexpected. As an opposition leader up against giant companies and international financial institutions that sought to grab indigenous lands, as an organizer against a patriarchal system that dominates women by force, and as critic of imperialism’s arming of repressive forces in Honduras, Berta Caceres was a marked woman. And she knew it. On March 3, hit men entered Berta’s house in La Esperanza, in Lenca indigenous territory. In the middle of the night they burst in and shot her and then her colleague, Mexican environmentalist, Gustavo Castro. The murderers committed this atrocious act knowing that to kill Berta—recognized worldwide for her defense of indigenous and women’s rights—would carry a high political price. But their determination to silence Berta won out over political calculations, for two reasons. First, because the race to gain control of dwindling natural resources, removing all obstacles in the path, has reached a point where in lawless countries like Honduras social and human costs don’t matter any more. And second, because Berta’s voice was not just any voice. It was, and continues to be even after her death, an extraordinarily powerful and articulate voice, a voice that united people in defense of land and rights, and that brought together thousands of likeminded people and organizations throughout the world. Berta Cáceres led the opposition to the construction of the Agua Zarca Hydroelectric Project. The project included a series of dams on the Rio Gualcarque, the sacred river of the Lenca people. Indigenous communities protested that they had not been consulted and the project would cause severe environmental damage and uproot their communities and livelihoods. As a result of the efforts of the organization she co-founded, the Civic Council of Popular and Indigenous Organizations of Honduras (COPINH), Chinese investors and the World Bank backed out of the project led by the Honduran company, DESA, but Finnish and Dutch financing remained. COPINH members have organized to recover ancestral lands and have won victories in blocking infrastructure projects imposed despite indigenous and environmental opposition. In many ways, it was the success of the organization and Berta herself that made her a target. Just a week before the assassination, Honduran federal agents threatened Berta directly in a confrontation with members of the organization resisting evictions from their lands. The assassination brings worldwide attention to the human rights crisis in Honduras. What’s at stake is the effort to rapidly transform a sovereign nation into a hunting ground for transnational corporations where, armed with private security guards and the support of government armed forces, they hunt for profits in the forests, rivers and seas that have been the lifeblood of human and animal communities for centuries. Since the coup, the governments of Porfirio Lobo and now Juan Orlando Hernandez have handed out hundreds of permits and concessions to private companies for energy and tourism megaprojects and mining operations. So eager is the government to sell off public resources that it has adopted a “model cities” plan, formally called Employment and Economic Development Zones”, to attract foreign investment. These zones cede national territory and natural and human resources to transnational companies, which are then allowed to institute their own legal, political and administrative systems based on neoliberal economic principles. Indigenous, rural and urban communities that actively oppose this all-out effort to transfer natural resources to global capital automatically become the enemy. Global Witness reports that between 2010 and 2014, 101 environmental activists were assassinated in Honduras. The Mesoamerican Network of Women Human Rights Defenders reports that in the region women defenders of land and territory receive more threats and attacks than any other category of defenders. The process of transformation of land use in Honduras has been accompanied by massive militarization. Private security guards hired by companies and businessmen now outnumber police and armed forces, according to a UN report, and in some cases can be considered mercenaries due to their role in clashing with the population to defend the interests of foreign companies. Then there are the military and police, which have been known to attack populations organized in defense of land and territory, as in the recent case of a young Garifuna man murdered by the Honduran armed forces last December. The US government has supported the deployment of the Honduran armed forces with the pretext of the war on drugs. Millions of dollars in aid have flowed to the country, despite hundreds of documented cases of human rights violations and executions of civilians. In a nation where impunity reigns, and where violation of the law is a constant within the same institutions that are charged with enforcing it, U.S. support to the security forces bolsters a repressive apparatus that is frequently used against the population itself. The result is the erosion of what was left of the rule of law. Drug trafficking has increased alarmingly in Honduras since the coup, at the same time as U.S. arms and security programs have spread throughout the country. In her last public declaration, Cáceres invited the society to join an international effort called the Caravan for Peace, Life and Justice against the misnamed war on drugs that creates the conditions for imposing the neoliberal transformation, as the force of contention against popular resistances. The murder of Berta Cáceres occurred in the context of the 2009 military coup d’état that was never resolved. That year, after many deaths and daily mass demonstrations in the streets for nearly five months, the maneuvers of the U.S. government and the coup leaders prevented the return to power of the democratically elected president, Mel Zelaya and the restoration of the constitutional order. Illegal elections were held, organized by the coup and boycotted by a large part of the population that demanded an end to the illegitimate regime. Cáceres cited this statement frequently to prove firsthand what was already evident at the time: the central role of the U.S. government in perpetuating the coup d’état in Honduras. That history that goes beyond the scope of this article. What’s relevant is that this sin of origin—the failure to restore constitutional order in Honduras after the 2009 coup—gave rise to the many deadly sins that have followed, giving Honduras one of the worst human rights records in the world and culminating in the assassination of Berta (up to now, because there were many before and, sadly, there will likely be others to follow). They killed her because she was an obstacle, and because the message of 2009 was read loud and clear: if crime benefits the powerful, it will go unpunished. In other words, they killed her because they knew they could get away with it. Endemic crime and corruption in Honduran institutions make it absolutely necessary to demand an independent investigation into the assassination. There is a major risk that the Hernandez government will attempt to write it off as a crime of passion, a common robbery or a conflict within her own organization. In this way it could attempt to criminalize, and it won’t be the first time—the victims. The U.S. State Department has steadfastly refused to call for an international investigation to date. In the context of predatory capitalism, human life is devalued. If people have to be killed to pave the way for profits, they will be. And Berta was a huge boulder in the road to converting Honduras into the latest laboratory for corporate globalization. She ended up on the growing list of defenders of the rights of indigenous peoples, campesino, LGBT, dissidents and others who have fallen in Honduras since the coup. But in addition to her role, Berta Cáceres had an extraordinary voice. Her indigenous worldview gave her spiritual strength and the clarity of viewing the environment as Mother Earth that must be constantly protected. Her anti-capitalist and anti-imperialist analysis provided her with a framework to understand and explain what was happening to her people by linking it to the national and global context. She believed in international solidarity to confront an international system that continually threatens the peace and wellbeing of the vast majority in all parts of the world. And she was profoundly feminist. She said that defense of the environment is by definition anti-patriarchal, that the defense of territory implies the fight for women’s rights because patriarchy considers a woman’s body as its territory. It is this integral resistance that they wanted to kill. Berta Cáceres united sectors and issues, across borders. And by bringing paths together, she was building a broad road to freedom. That is the road she has left to her children, and to the many others who will follow in her footsteps. When Berta Cáceres Flores was assassinated in a political murder on March 2, she was in the midst of an intense struggle in defense of the Gualcarque River, a sacred river for the Lenca people. She and the Lenca people of Rio Blanco had already blocked the Agua Zarca Dam from being built on the Gualcarque River one time, in 2013-2014 and now DESA was making a second attempt. During the 2013 struggle against the Agua Zarca Dam, Indigenous leader Tomas Garcia was murdered by the Honduran military, other Lenca leaders were attacked, Berta received numerous death threats, and the military detained Berta on trumped up charges. Soon a second set of charges followed, and Berta was ordered to jail. She went underground, and after months international outcry, the charges were eventually dismissed. However, DESA, the company trying to build the dam, appealed and requested the charges against Berta and two other COPINH leaders be reinstated.In approximately August of 2015, DESA began attempting a second time to build the Agua Zarca Dam, this time accessing the Gualcarque River from the opposite side of the river in San Francisco de Ojuera. Berta and many Lenca people again mobilized to defend the Gualcarque River and their ancestral territory. As they organized to stop the dam, the situation again began to intensify. On November 4, 2015, when Berta was not home, an unknown man took a laptop with significant COPINH information from her home. On the night of November 6, 2015, three shots were fired towards Berta as she driving to Rio Blanco. On November 30, 2015, Berta Cáceres and other COPINH leaders were traveling to request a meeting with the Mayor of San Francisco de Ojuera, who had authorized the dam, when the Honduran police detained their vehicles. While they were detained, machinery dug huge holes across the public roads to prevent COPINH from passing. After Berta and the rest of the COPINH members finally reached San Francisco de Ojuera, municipal employees began to throw rocks at them and threaten them, including a threat that Berta was the one “who had to be killed.” One of the armed men came close to Berta and almost cut her chest with a machete. All of this occurred as the Honduran police and military watched and did nothing, despite Berta requesting their protection. Finally, Berta called the Minister of Security, Julian Pacheco, and requested he relay orders for the police present to provide protection. Still, the police and military did not respond and the harassment continued. Then in late December 2015, the Honduran police detained two men for illegal possession of weapons. Berta was informed that one of them is reported to have explained he was contracted by DESA because “the COPINH people were f**ing things up a lot.” This man was previously involved in a violent attack on a COPINH member who opposed the dam, and his police files indicate he was involved in a murder. Residents of Rio Blanco report that he had previously stated he was going to kill COPINH members, including Berta and Francisco Javier Sanchez, President of the Indigenous Council of Rio Blanco. Berta received information that Jorge Avila – the head of security of DESA and former police official – moved money around to secure the release of those detained for illegal possession of weapons despite the murder in police file. Shortly after his release, this man was identified by Rio Blanco residents working with DESA’s security team without a uniform. In February 2016, Berta wrote a communique publicly denouncing the money provided for this man’s release and stated that there were known paramilitary guards working for DESA who made threats against COPINH members. Early in February 2016, shots were fired in the vicinity of Berta’s home shortly before she arrived. On February 16, Berta and other COPINH leaders were pursued by armed men as they left Rio Blanco, after visiting with the Lenca people in resistance to the Agua Zarca Dam on the Rio Gualcarque. The armed men pursued Berta’s vehicle on the isolated road for at least 20 minutes until Berta reached a town and stopped. Then on February 20, 2016, as Berta and COPINH members traveled to San Francisco de Ojuera to protest the dam, employees of DESA and the Mayor’s office threatened, detained, and harassed them as well as vandalized the vehicles and buses as the police and military looked on. COPINH members report that the Vice Mayor of San Francisco de Ojuera threatened Berta, telling her she would never come back there and that she could be killed. On February 25, as the police and military evicted about 50 COPINH families from their homes in Jarcia, Guinse, Intibuca, a member of the DGIC harassed Berta and told her the security forces would not respond if something happened to her. On February 26, at 1:45pm, a new, double-cabin truck with polarized windows drove up the road leading to the COPINH office, stopping before reaching the office. A tall man with a military-style haircut got out and went outside the COPIN office and asked for Berta, while another man stayed in the running vehicle. When informed she was not there, he wanted to know where she was and her phone number. When asked to identify himself, he refused and left. Despite all of this, and many additional threats, Berta and COPINH continued forward in the struggle to defend the Gualcarque River and all Lenca territory. Berta repeatedly denounced the concession of the Gualcarque River by the Honduran government to DESA in violation of the Lenca people’s right to free, prior, and informed consultation. She also spoke against the violence, militarization, hitmen, and repression that DESA and the Honduran state were using to impose the dam. Berta denounced the Dutch Bank FMO and the Finnish Bank Finnfund, majority owned by the Dutch and Finnish governments respectively, for financing DESA for the Agua Zarca Dam project despite having been informed of the human rights violations around the dam. Berta was in the process of planning a trip to Holland and Finland in which she and Rio Blanco Lenca leaders would protest the financing of the dam and request Dutch and Finnish government leaders take action to stop the funding. On March 2, 2016, DESA’s head of security was spotted in a vehicle with about 16-20 people, at the turn off from Honduras’ main highway to La Esperanza, where Berta lives. The men were speaking about Berta. The vehicle headed toward La Esperanza. 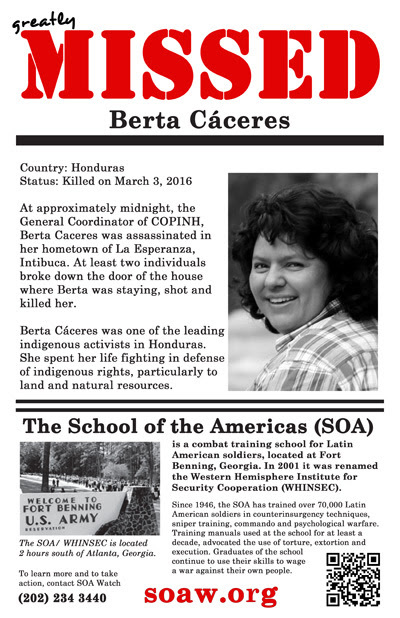 That night, two men forced their way into Berta’s home and Berta was assassinated. Berta was a voice not only for the self-determination of the Lenca people but for all Hondurans. She was a very outspoken leader against the 2009 military coup and the resulting repressive regimes. She led COPINH in supporting numerous Lenca communities struggling against displacement, dams, privatization of their resources, and megaprojects imposed on their territory against their will. She was a national leader in the struggle against the ultra-neoliberal plan being imposed on Honduras, which entails the privatization and exploitation of almost everything possible, and the brutal repression against those who resist. Berta spoke out against the US backed Alliance for Prosperity plan being put in place in Central America, clearly explaining that its militarization and economic privatization and exploitation projects will only bring more destruction and death to Honduras. She was a leader in the Platform of Popular and Social Movements of Honduras, pushing for national articulation of the social movements. She loudly criticized the current regime for its repression of Honduran society, and refused to be silent. No matter how many death threats she received, no matter how many times she was followed, pursued, or threatened, Berta would not be silenced. And she must not be silenced today. Berta’s voice and struggle must continue to be heard. I can hear her right now, asking us to go to Rio Blanco to accompany the Lenca people as they are criminalized and repressed for resisting the dam. I can hear her asking us to organize to pressure FMO and Finnfund to cut their funding to the dam and to demand that the Honduran military and US-backed TIGRES leave Lenca territory. And I can hear her loudly and clearly telling US Congresspeople, just as she did in meetings barely a year ago, to stop supporting the Honduran regime, to cut all Honduran military funding, to end the Alliance for Prosperity. I can hear her voice denouncing international banks and multinational corporations who together with the current Honduran regime and the support of the US plunder the Honduran territory and its people. I can hear her calling for an end to the criminalization of COPINH and for respect for the self-determination of the Lenca people. More than anything, I can clearly hear Berta saying that the female spirits of the Lenca people live in the Gualcarque River.